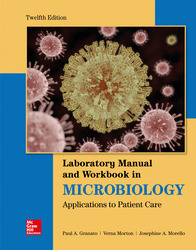 This lab manual emphasizes the basic principles of diagnostic microbiology for students preparing to enter the allied health field. Students are led through a series of exercises that allow them to learn basic microbiology techniques and practice safety in the laboratory and hospital environment. It is primarily oriented toward meeting the interests and needs of those who will be directly involved in patient care and wish to learn how microbiological principles should be applied.